Jan. 24, 2019–­It was with sadness that we learned of the January 21 death of acclaimed columnist and humorist Russell Baker – but at the same time, it was impossible not to smile and chuckle at the mention of his name. 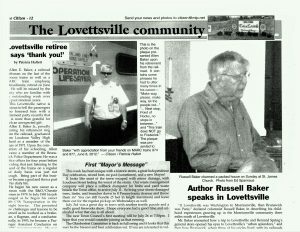 One of the best-attended lectures that the Lovettsville Historical Society ever held, was the one with Russell Baker on July 8, 2012. 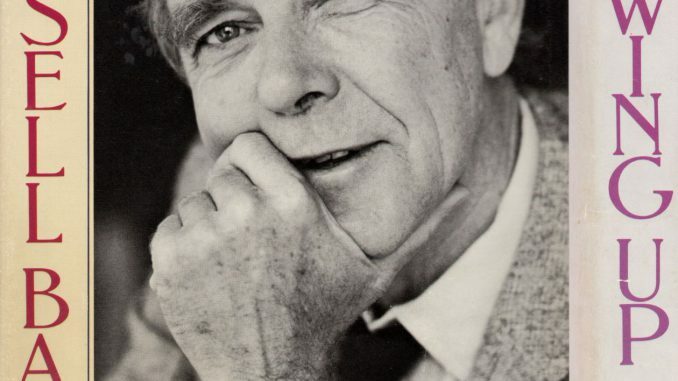 It was a standing-room only crowd, who had come to hear the legendary writer and columnist in one of his last – if not the last – public appearances. In my almost ten years of coordinating the lecture series, it was one of the highlights. 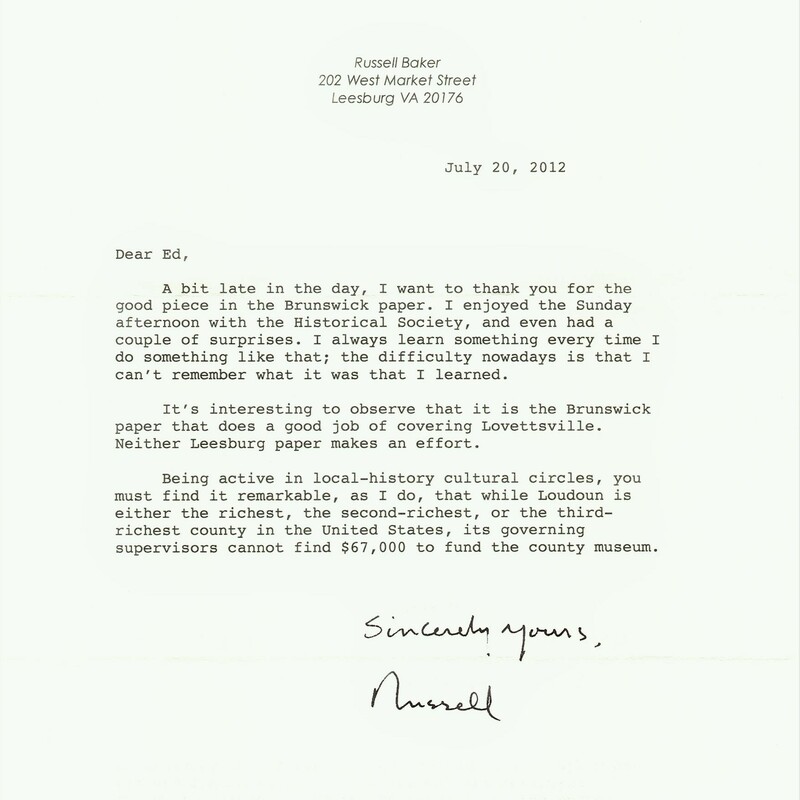 “If Lovettsville was Washington to Morrisonville, Brunswick was Paris,” declared columnist Russell Baker, in describing his childhood experiences growing up in the Morrisonville community three miles south of Lovettsville. The Pulitzer Prize-winning author was speaking on Sunday, July 8, to a packed house at a lecture sponsored by the Lovettsville Historical Society, held at St. James United Church of Christ. Mr. Baker amused and delighted the audience of more than one hundred persons with his stories of life in this area in the late 1920s and early 1930s during the Great Depression, in the area known as “the German Settlement.” He talked about bootleggers, life without indoor plumbing or electricity, the thrill of a rare glimpse of an automobile in Morrisonville, local politics, and a visit by the Ku Klux Klan during 1928 presidential campaign. After his opening talk, Mr. Baker was peppered by questions from the audience, which was thoroughly enjoying his humorous recollections. 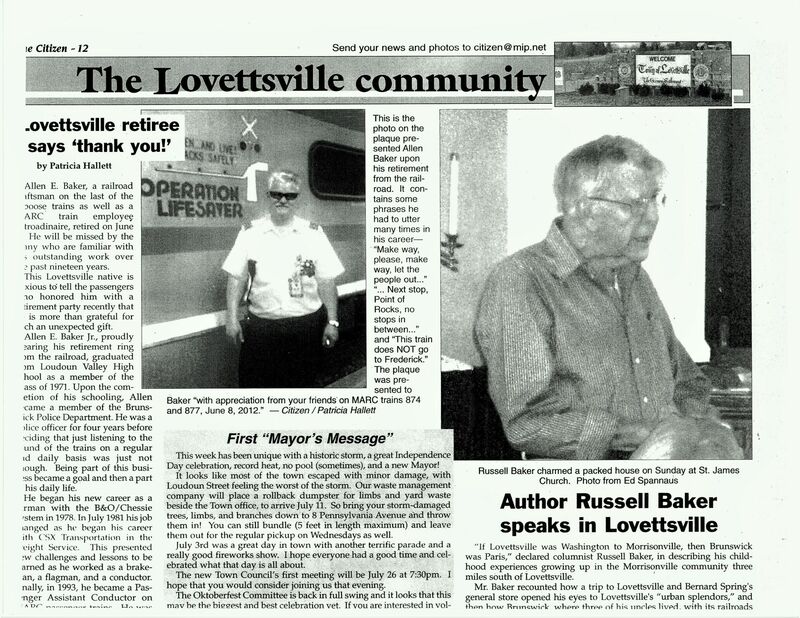 Although retired from his long career in writing and public speaking, Mr. Baker generously agreed to speak as a gift to the Lovettsville community. Mr. Baker’s cousin Berkeley Baker and Berkeley’s wife Edna were mainstays of the Lovettsville Historical Society for many years. In 1979, Mr. Baker won his first Pulitzer Prize for his New York Times columns, and in 1983 he won his second Pulitzer for his autobiographic book Growing Up, a memoir of his childhood experiences during the late 1920s and the 1930s, around which he built his talk on Sunday. How did all this come about? At the time, my wife and I were helping a friend care for her 91-year old mother Nettie, a born-and-bred New Yorker who was living in a nursing home in Leesburg. 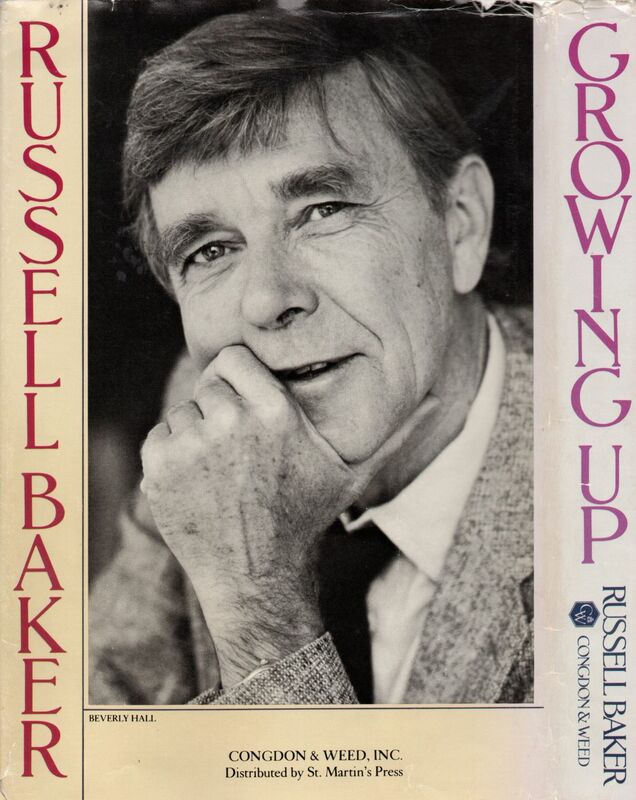 Nettie couldn’t remember what had happened two minutes ago, but she had a razor-sharp memory of her childhood and life in New York City – and one of the things she remembered very well was reading, and loving, Russell Baker’s column a couple of times a week in the New York Times. These conversations reminded me that Baker had been living in Leesburg since at least the 1980s, so I decided to try and find him. When I “googled” him, I found that his last speaking appearance had been at the National Lutheran Home in Rockville, arranged by Edna Baker. Edna’s late husband Berkeley was a cousin of Russell. Edna and Berkeley had been active in the Lovettsville Historical Society, and were members of New Jerusalem Lutheran Church. Here were a number of openings. Through friends in the community, I put out the word that we wanted to get in touch with Baker and invite him to speak. A relative provided his address and phone number in Leesburg, so I wrote to him, inviting him to come speak in Lovettsville. I sent the letter off, not knowing what to expect, and followed by leaving a message on his phone. 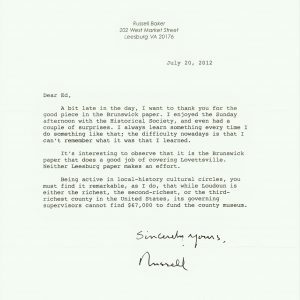 Almost two weeks after the letter, he returned my call, and said he would be happy to give a talk for the community. He said he didn’t want a big crowd, as he saw it as an intimate type of event for the regulars. He reiterated this the next time we talked, and we agreed on a minimal amount of publicity. He expected to speak for ten or fifteen minutes, and then take questions. Needless to say, the word got around the community, and at least a hundred people showed up at St. James church on July 8 to hear him speak. Even though his voice was somewhat weak, his thoughts were clear and his message was strong. He spoke quite a bit longer than 10-15 minutes, and then answered question after question from the appreciative audience.